We are often mistaken to believe that the best dishes are made from a sophisticated recipe. Behind the curtains though, we all have to agree that the tastiest foods are the simpliest foods after all. Deep-fried nooroongji meets that category. 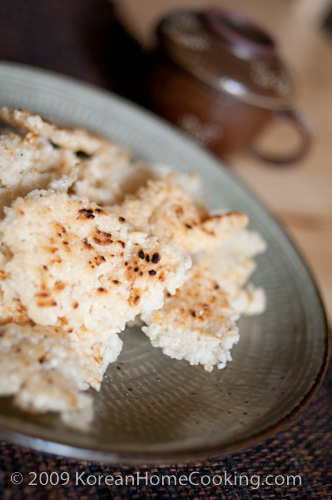 Nooroongji is a slightly burned rice which could be easily made from overcooking your rice, or by roasting a thin layer of cooked rice on a griddle. This is a good way to utilize those left-over rice. 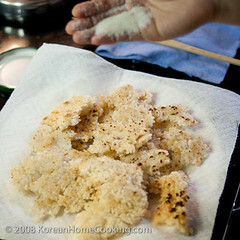 Deep-fried nooroongji with sprinkles of sugar makes a wonderful rice snack for the young and adults. 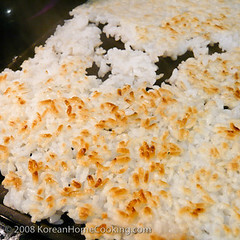 On a griddle, spread a thin layer of cooked rice over low to medium heat. Roast them on both sides until they turn crispy and golden brown in color. You can stop here and eat this right away as rice snack. Or, keep reading below to make deep-fried nooroongji. Deep fry the nooroongji from Step 4. This isn't something I've had before, but it looks delicious. I'll make it for my kids today... thank you! I think kids will love it. I am not sure if you have tried the Korean snack called Ssalopoong (쌀로풍) made by Lotte. This dish tastes just like that snack. But obviously this makes a much healthier alternative because it doesn't have preservative or no-good additives. Remind me of the rice I use to go crazy for when my mum would cook rice on a clay pot. vegetables (and some form of protein if you wish)containing some sauce. Keep hot. 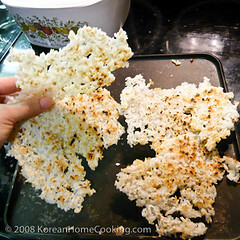 Heat a metal plate and layer some deep fried rice on it. Pour the vegetables on top and let it sizzle! The rice will be soft and crispy - delicious with the sauce from the vegs. You can also put a layer of freshly deep-fried rice in a large soup bowl. Add hot broth containing vegetables and protein, let it sizzle, then enjoy the combination of wonderful flavours from the rice and soup. Sweet potato or yam chunks are cooked along with rice on top of the stove (not rice cooker). 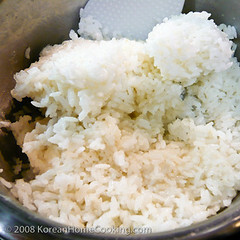 After the meal and the rice pot is near empty, gently brown the bottom layer of leftover rice. Mash some of the sweet potato all over the bottom, then immediately pour in some hot water. 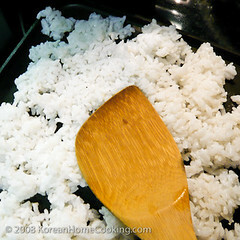 After the rice stops sizzling, scrape up the rice and enjoy. It's the flavour from the "burnt rice" that makes this so delicious. Could this be a Chinese dessert? ;-) This takes it one step further to what ((K@Y)) posted. I miss my mom making 누룽지 for me! I make it here too but it's just not the same. Thanks all for sharing wonderful stories and recipes! I would love to try 'sweet potato-burned rice porridge'. Sounds so yum! 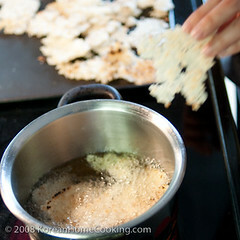 ricediaries, a griddle works well when you are making nooroongji. Try it if you haven't. my goodness, I stumbled here looking for something completely different... this looks ridiculously delicious!